Atlantic salmon farming in Washington and British Columbia waters faces ongoing scrutiny that is putting the industry in jeopardy. A showdown is brewing over Atlantic salmon net-pen farming on both sides of the U.S.-Canada border. 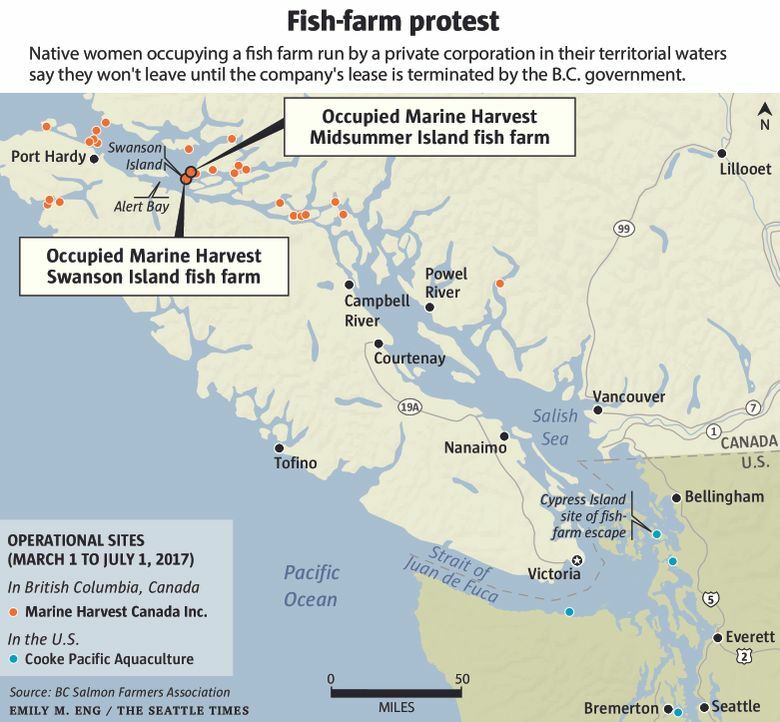 Marine Harvest, a major producer of farmed Atlantic salmon in British Columbia, is seeking a court order to evict First Nations women who have occupied one of its fish farms, an order it intends to enforce by police action if necessary, said Ian Roberts, spokesman for the company. 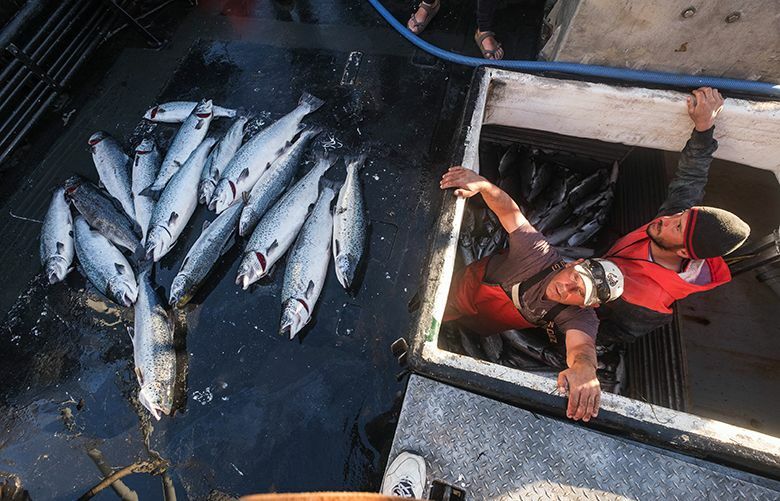 Marine Harvest operates 11 open-water Atlantic salmon net-pen farms in the Broughton Archipelago alone, at the northeast end of Vancouver Island. Ten of the farms have leases that are up for renewal by the B.C. government in June, and two of those farms have been occupied by First Nations people who say they won’t leave until the leases are canceled. The showdown comes at a sensitive time for fish farms on both sides of the border. The Minister of Agriculture for British Columbia, Lana Popham, in a letter last month cautioned Marine Harvest that the government is committed to implementing the U.N. Declaration on the Rights of Indigenous People. Meanwhile, in Washington state, lawmakers will hold their first work session Wednesday in Olympia to discuss the collapse of Cooke Aquaculture’s Atlantic salmon net-pen farm at Cypress Island last August. Sure to be discussed is not only the ongoing state investigation of the loss of more than 100,000 Atlantics into Puget Sound, but a possible move by several lawmakers to end net pen farming of Atlantics in Puget Sound. Cooke Aquaculture — which has struggled in its relationship with Washington tribes — has apologized for the escape and asked for patience from Washington lawmakers and residents to give it a chance to retain and grow its business operation here. Nell Halse, spokeswoman for Cooke, said she had no comment on the situation in British Columbia. “If any of our farms were threatened, we would respond as any commercial business or property owner would respond to trespassing. We would call the proper authorities,” she said in an email to The Seattle Times. Meanwhile, in B.C., the number of protesters and supporters for the First Nation occupiers has been growing since word of the eviction spread on social media last week. Alexandra Morton, a long time opponent of the fish farms, and Sea Shepherd, have championed the cause for months and Morton has created a video about it. One Marine Harvest occupation is at its Swanson Island farm, where First Nations people are now occupying company-owned cabins on the land side of the farm, moving from the open water net pens they began occupying last summer. 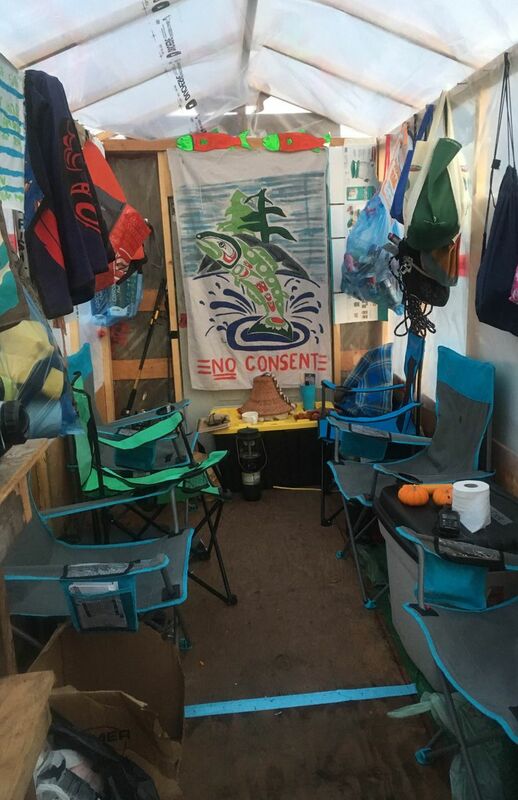 At its Midsummer farm, three occupiers have set up a makeshift shack with a wood stove, bunk beds, a tent and a cook house on the walkways of the fish farm, floating in the open water. A member of the Da’naxda’xw/Awaetlala First Nation at Knight Inlet, she said her band has never signed a treaty with any government, and the fish farms run by Marine Harvest have no right to be there. And she is defending her people’s sacred food: wild salmon. She wakes up each day to the sound of the automatic feeders slinging salmon chow into the pens. She said the fish-farm workers have been courteous, alerting her and others occupying the farm when they turn on the ankle-high electric fence around the perimeter of the farm, to keep out seals and sea lions. Ernest Alfred, a former elementary-school teacher, has left the classroom to continue occupation at the Swanson Island fish-farm site. He and Glendale’s mother traveled to Port Angeles recently for a hearing convened to protest Cooke Aquaculture’s planned net-pen expansion in the Strait of Juan de Fuca. Those plans are on hold after Washington Gov. Jay Inslee declared a moratorium on new net-pen operations following the Cypress Island net-pen escape — but opponents are continuing to fight it all the same. “We stand in solidarity for the people that are battling fish farms there, and we have invited them to come up and be with us,” said Alfred, a member of the Namgis nation and a hereditary chief. 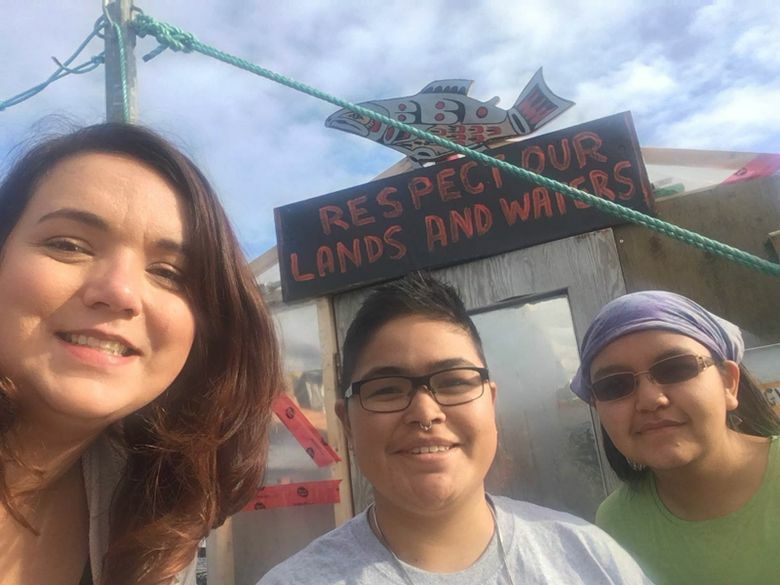 Roberts, of Marine Harvest, said the company “has repeatedly sought dialogue with local First Nation leaders for a safe and peaceful resolution to the protest at our workplace, and asked that activists not enter the private work site. Neither has happened. Roberts said it was troubling to the company that Popham, the minister of agriculture, also asked the company to hold off on putting more smolts in one of its other pens to continue business as usual.